Signup Deadline For Participation In Techsurvey12 Is January 11th -- Hurry! Do you really have any idea about what are your listeners really doing while they are listening to radio, and when they are not? What do they think of radio and the various streaming alternatives? Radio's most important and insightful data set about your listeners and their current habits is coming to WORLDWIDE RADIO SUMMIT 2016. It's the largest and most important survey in radio for Owners, Management, Programmers, Social/Digital and the Music Business -- JACOBS MEDIA's TECHSURVEY12! Look for the first public reveal during WWRS 2016, APRIL 13th, 14th, 15th at the HOTEL ROOSEVELT, HOLLYWOOD, CA -- presented by ALL ACCESS and A&R WORLDWIDE. Once again this year JACOBS MEDIA Pres. FRED JACOBS will have the most up-to-date information about what your listeners are doing in their car, on their handhelds, desktops, and while at home, which he will discuss exclusively in TS12, THURSDAY, APRIL 14th, 12 noon at WORLDWIDE RADIO SUMMIT 2016. Make sure that you are on-hand for this must-see, must-attend session ... click here to register for WWRS 2016 for only $445. Previous JACOBS' TECHSURVEYS have been uncanny in their ability to predict consumer behavior, while providing actionable data. From the "cell phone only problem" in TS1, to the satellite radio slowdown, to the rise of smartphones and tablets along with the ascent of PANDORA, these national research studies have been predictive and an important part of radio's digital planning process. TECHSURVEY12 will launch in mid-JANUARY with the deadline for registration, JANUARY 11th! Sign up now for TECHSURVEY12 here. 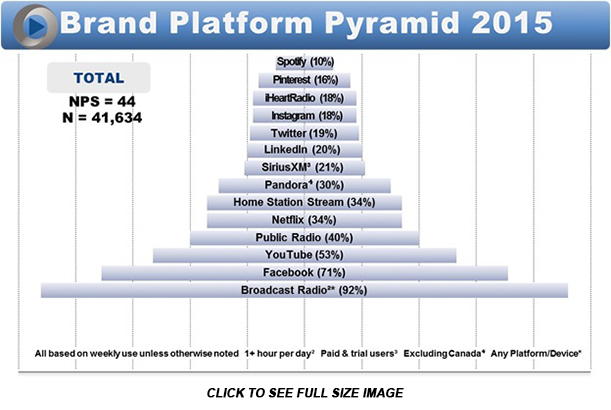 In TS11 some exciting things took place, including the creation of a new BRAND PLATFORM PYRAMID (below) that helped stakeholder stations better understand the role that channels like YOUTUBE, NETFLIX, FACEBOOK, and SIRIUSXM play in their lives. As in the past few years, we will produce a "stakeholders" webinar for participants in APRIL, followed by its public debut to the industry at WORLDWIDE RADIO SUMMIT 2016, APRIL 13-15. Once again, TECHSURVEY12 will cover all formats. Last year's survey included record-breaking crosstabs for 13 different formats. You and your family of stations are invited to be a part of this year's historic TS12 survey. This is a great opportunity for every station in your company and cluster to participate. If your stations have a viable database, they are invited to take part. Further examination of how generations impact behaviors and media choices, especially Millennials and their younger siblings, Generation Z.
Identifying how radio fits into the exploding array of options that your listeners have before them - on their computer screens, their smartphones and tablets, and in their cars. The growth of podcasting, and how radio can create a smart strategy that meets consumer needs. Interest in and awareness of the FM radio chip in smartphones. In TS12, we will have tracking data as well as new questions that break down the importance and progress of "connected cars," and how your audience consumes your station - and other content - while on the road. Social networking growth - specifically, FACEBOOK, TWITTER, PINTEREST and INSTAGRAM - and how they impact our key format groupings. Use of Internet radio, from station streams to the new BEATS 1, PANDORA, SPOTIFY, iHEARTRADIO, and others, and how your listeners connect with your station utilizing your stream, website, FACEBOOK page, TWITTER, blogs, and podcasts. We'll continue to ask important questions about mobile phones and tablets - especially as APPLE, SAMSUNG, and other brands continue to develop new models. Due to popular demand, online gaming will make a return in TS12. And of course, apps, how they're used and which features matter most. A small participation fee for local station data. We will survey your station database (up to 700 completed interviews). You'll receive your local market data, the total survey data, format data, and your own MEDIA USAGE and BRAND PLATFORM PYRAMIDS. You will also be able to participate in a free webinar that reviews the data this spring. No fee. If you elect to participate, but not pay the fee, you'll receive the national findings, the two pyramids, as well as participation in the webinar. However, no local data is included. However you opt-in, your participation in TECHSURVEY12, the largest survey of its kind in radio, is appreciated. TECHSURVEY12 goes to the field in mid-JANUARY, so we need your commitment by JANUARY 12th. Register here. If you have more than five stations to register, please contact LISA RIKER directly via email at lisariker@jacobsmedia.com or call her at (248) 353-9030 for discount pricing. TECHSURVEY12 -- all part of the dynamic sessions at WORLDWIDE RADIO SUMMIT 2016. We will see you there!